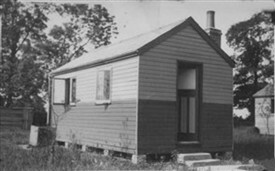 The first photo is a family group standing in front of a shed. The woman in the tent is my grandmother and the the guy in the waistcoat is my great-grandfather (my grandfather's dad) the guy on the left is Alf who was one of my great uncles. The second photo is of the ‘shack’ which is quite substantial with a brick chimney stack. Its name ‘GWENDOBO’ is a concatenation of my mother and grandparent's names so it must predate my aunty’s birth. There appears to be a second ‘shack’ on the right and the shed from the first picture is on the left. 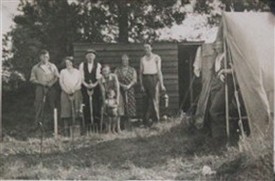 There are a number of other pictures of family members working a vegetable plot with shed in background, and a view of a tree lined road entitled "Near Smith’s farm”. Another view of the by now famous shed is captioned with the critic comment “Alf’s tent is next door”. The period would be between 1933, when my grandparents married, and 1937, when my aunt was born. 1937/8 is also the time my mother’s family began to migrate north to Merseyside via Birmingham and mid-Wales. I know there was a movement to rent small holdings to ex-servicemen after WW1 which fell by the wayside in the 30’s. The question is was this such a ‘community’ of veterans (my great-grandfather served in the war) or a more commercial affair of small holdings? Of course it might be we were just squatters! Could we localise the area occupied with a map ref so I can show my mum on Google maps? That would be great. Any other information would also be appreciated. Thank you in advance, Mike Parsons. Hi Mike. I have added a bit extra below. Unfortunately there does not appear to be any lead to "Smith's Farm" on any maps we have looked at - or any street names etc that might localise your property. However, the entire area is quite small. It might be that your "squat" was somewhere between The Drive and the river but that is pure conjecture. 1. Two maps of the plotlands courtesy of NLS (National Library of Scotland). Click here to see two maps on the NLS site and use the transparency slider on the NLS page to fade between them. One map is an OS of Hullbridge 1885-1900 and the other is a modern satellite map with roads marked on it. 2. Here are a few current photos of the plotlands development - Feb 2016. The photos were taken in the area between The Drive and the river. Click on any photo and then use the associated Next/Previous links to move between them. This gallery was added by Robert Stephen on 14/04/2017. My Grandparents bought 3 plots of land in the late 1920's in Burnham Road, Hullbridge. Initially they used it as a weekend retreat travelling from London, but in 1930 built a permanent house there which was not much more that a wooden shed to start with but over the years was extended. I remember it well in the late 1940's. My grandfather named it over a hill he fought over in Gallipoli in WW1. All of the surrounding roads were just grass tracks with just a few other wooden houses dotted about, water and gas was laid on but that was all, electricity was laid on in the late fifties. I remember the road being laid in the mid sixties, I believe each household had to contribute something towards it, which is why it is only single lane with passing points. I may be able to shed a little light on the question of "Smith's Farm". The following information was obtained from the memories of the late Harry R. Wright who was a life long resident of Hullbridge. During the 1920's/30's Montague House (now the Simla Restaurant) was owned by a Mr and Mrs Smith. Their garden, mostly given over to orchard was very extensive, stretching some distance along Ferry Road. You could not call the Smith's property a farm by any means, it was more in the nature of a small holding. They used to sell their garden produce outside the house to passers by. I visited the plotland museum and nature reserve at Dunton some years ago and recall that you could buy booklets and other information there. From the comments the plotlands are a known feature of the area, though now built over. Is there a source I can access giving some general history/information about them? The plotland area where Mike's family had their home has completely disappeared now and been replaced with mostly large, detached homes. When I lived in Hullbridge in the late 1960s/early 1970s the pre-war homes were more or less as originally constructed. It was a small area of unmade grass tracks leading off The Drive towards the river Crouch. The small wood and breeze block buildings were constructed on each side of the track. Each property had a large area of land around it and most had a verandha built on the sunny side. It always seemed a wonderful carefree place to live when I visited friends who, I think, lived in The Walk. Lovely in the summer but maybe less so in winter. I am pleased that the path along the riverbank towards Battlesbridge is still there and a small area of grass and woodland where some of the country atmosphere still remains.